Sunday, November 10 1907 -- "Young" Peter Jackson and Sam Langford, both boxers of color (as Herriman makes painfully obvious in his highly derogatory cartoon) are to meet in the ring on Tuesday. The headline's reference to "a real one" harks back to some previous bouts in which Jackson and his opponent had prearranged a draw. Since Herriman won't be contributing a cartoon about the completed match I'll spill the beans that Jackson and Langford went the full 20 rounds and the decision went to Jackson..
Hello, Allan---It seems odd that everyone knew that boxer Jackson was in a series of fake fights, and still was apparently cared about!------Cole J. Which country is the best -- Germany, England, France, or the United States? Given that we're looking at a strip published in the Philadelphia Press, I'm betting you can guess Kahles' answer to the question even before you've read the samples above. 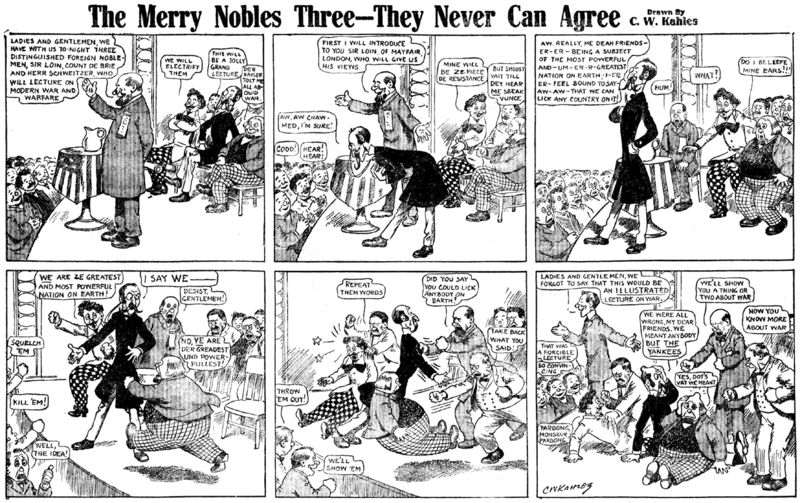 Charles Kahles penned the amazingly repetitive series The Merry Nobles Three -- They Never Can Agree for the Press as a Sunday feature from February 11 to December 23 1906 with nary a variance from the formula seen in our samples above. 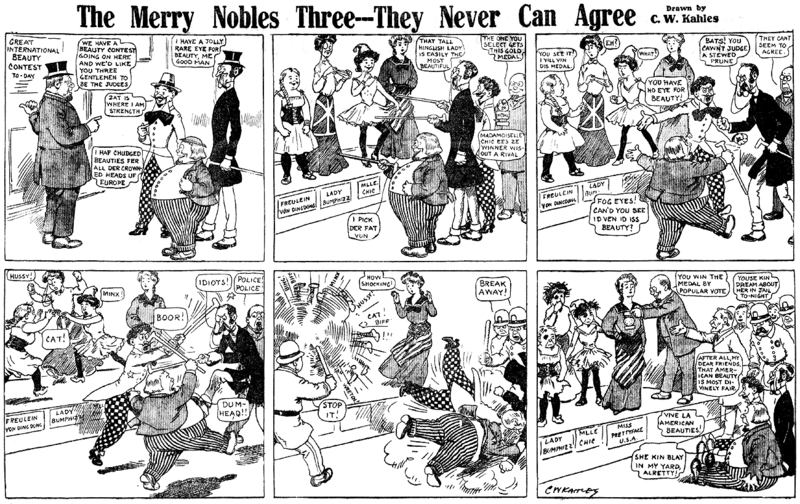 Kahles must have practically penned these in his sleep because in addition to their regular appearances in the Sunday section the strip also popped up in occasional daily issues of the paper (first on April 5 1906, last on September 4). Though the gags are on auto-pilot, we can still enjoy Kahles' beautiful linework. The art is especially detailed on this strip because it almost always ran on an inside page of the Press' Sunday section with no color. The Press at this time didn't use spot color on their interior pages but just printed the whole thing in a single color, usually a dark brown, green or red. Much thanks to Our Man in Philly, Cole Johnson, for the scans! The newspaper syndicate business is emerging from a period of unprecedented restlessness. Never before has there been such action in mergers, sales, suspensions, and consolidations. Is this shifting to be interpreted as a natural evolution of the business? Does it mean the "survival of the fittest," the elimination of the small syndicate? Are there benefits, other than economical, in the consolidation of various services under one management? Editor & Publisher this week interviewed a number of syndicate executives to find out how the syndicates themselves view the recent activity. The answers varied, some of the executives feeling that the wave of mergers is just beginning, others that the period is ended, while some refused to see a trend of any nature. They all, however, agreed that the syndicate business was tightening up, and that a new organization entering the field faces many more obstacles than ever before. Merging of the North American Newspaper Alliance, the Associated Newspapers, and the Bell Syndicate into one organization under the name of North American Newspaper Alliance, George E. Miller, editor of the Detroit News, and former president of the N.A.N.A., is president of the new organization and John N. Wheeler, former president of the Bell Syndicate, is general manager. Sale of Metropolitan Newspaper Service to United Feature Syndicate. Monte Bourjaily, general manager of United, directs both organizations, and Maximilian Elser, Jr., former president of Metropolitan, continues under the new alignment as vice-president. Metropolitan has been reincorporated under the name of Metropolitan Newspaper Feature Syndicate. Both syndicates retain their identities. Sale of Central Press Association to King Features Syndicate. The Central Press staff and contracts were unaffected by the change, the only change in ownership of the syndicate. J.V. Connolly, as general manager of King Features, is the operating head of Central. V.V. McNitt, of the McNaught Syndicate was former president of Central Press. Purchase of the Independent Syndicate, New York, by Jay Jerome Williams, managing director of Current News Features, and the removal of the Independent Syndicate to Washington, D.C. Under a working arrangement Independent operates both services. Current News Features is owned by the Consolidated Press Association. Expansion of the Associated Press Feature Service to include a comprehensive comic strip and cartoon service for evening papers with plans advancing for a similar service for morning papers. I.M. Kendrick, as executive assistant to general manager Kent Cooper is in charge of the A.P. Features. Arrangement whereby the Chicago Daily News Foreign Service leases the wires of the North American Newspaper Alliance for eight hours each day. This arrangement, which was made before the reorganization of the Alliance, is unaffected by the new operation. This service formerly utilized Consolidated Press wires. Acquisition by the Consolidated Press Association of the New York Sun's foreign service and the rights to the material of the daily's staff special writers. All these activities seem to indicate that the day of specializing in one particular type of service is past. The trend has been toward the supply of a rounded service to publishers. The reason for this is that such a service is more economical both from the publisher's and the syndicate's standpoint, and that -- and that is considered an important point -- the newspaper's staff saves time in seeing one syndicate salesman where before he had to see several. There are several syndicate managers, however, who refuse to see a "trend" in the recent movements. George E. Miller, president of the North American Newspaper Alliance -- "I have no data upon which to judge the trend, if there be a trend, in the direction of syndicate consolidations. My information is confined to the action of the North American Newspaper Alliance in combining some of the existing larger syndicates, and this is purely a protective measure and is not aimed at the injury of any other interest whatsoever. "When a newspaper gives circulation to a continuing feature for a long enough period to make it familiar to its readers it has given that feature a distinct value in that community which it did not have before. Therefore that newspaper should be protected in its use. The Alliance has been reorganized to secure that protection and to guarantee that protection to all who buy the feature it places upon the market. To illustrate the principle, the Alliance has bought recently some features already widely sold throughout the country and is protecting the purchasers whether they belong to the Alliance or not. It will continue so to protect them as long as they desire to hold the feature. And it will guarantee the same protection to all who buy its features in the future, whether they are members of the Alliance or not. "The Alliance, composed of a large group of leading newspapers in the United States and Canada and supported by collateral members consisting of leading newspapers in every country on the globe, simply places the high ethical standards of these great publications behind its enterprise. And that is the whole story." John N. Wheeler, general manager of the reorganized North American Newspaper Alliance, and former president of the Bell Syndicate, sees the recent activity as a simplification process. "It is no longer possible," he said, "for a man with a bright idea to hire a little office space, buy some postage stamps, and say he is in the syndicate business. "The economic advantages to the merging syndicates are obvious. And from the publisher's viewpoint it is likewise desirable in that it will stem the inundation of salesmen and mail offers in the field. "I think the 'shakedown' is about ended now. I hear of no more pending developments. The North American Newspaper Alliance is planning no additional expansion." Monte Bourjaily, general manager of the United Feature Syndicate, said that his syndicate's primary purpose in acquiring Metropolitan Newspaper Service, was to strengthen the service which had for many years been handled by United. "We found that newspapers were looking to us for features other than those we had been distributing for several years," he said. "In order to make a well-rounded feature service we had to expand. We purchased Metropolitan because Metropolitan had precisely the sort of features that we needed. There was virtually no conflict between the two syndicates. Each had something that the other lacked. Now together we are in a strong position." "It seems to me that a small or weak organization cannot serve the newspapers in the manner they demand. On the other hand, a strong organization, with the purpose in mind of meeting the publishers' needs, is in a good position to do so." Following this reasoning, Mr. Bourjaily stated that he believed the consolidation in the syndicate field would continue until there were less than ten outstanding syndicates. He said that this movement was a natural concomitant of the mergers that have been taking place in the newspaper field. "These recent syndicate consolidations," he continued, "are a salutary sign of the ambition to make better newspapers. The syndicate's job, as well as the newspaper's, is to inspire readers to turn off their radios to read, and to stay at home with their paper rather than go off to the talkies. The syndicate that recognizes this aspect is the one that succeeds and will continue to succeed. And it must be buttressed in men, money and contacts to go out and find the kind of material needed. "The syndicates are being affected by the same forces that have been at work in the newspaper field. The fact that there are fewer newspapers at work today is resulting in the cutting down of the syndicates willy-nilly, whether they like it or not. Progress is implacable. "In most larger cities there are three newspapers. Obviously a hundred syndicates competing for the business of these three dailies represents a waste from many angles. It is my belief that there will be fewer but stronger and abler syndicates in the future." Mr. Bourjaily also made the point that newspaper publishers are naturally gratified at the new developments. One of the advantages to them, he said, was that the salesmen of the various services could show a complete roster of features, and that one salesman for one organization would be more welcome by the publisher than two or three with conflicting services that had visited him before the consolidations. "The competition for space in newspapers, for interesting readers of newspapers," he said, "is so keen today that it behooves us in the syndicate business to do everything in our power to get the best results." Maximilian Elser, Jr., whose Metropolitan Newspaper Service was sold to United Features with Mr. Elser remaining as vice-president, also cited the economic advantages of consolidation, and added that by reinforcing the mechanical forces of two syndicates, more time could be given to the editorial end of the work which he considers the most important. "The ideal set-up," he said, "is one that will help you give the best service to editors, and at the same time eliminate waste within the organization. "In selecting fiction for newspapers a great deal of discretion and care must be used. This merger with United Features allows me to give more time to editorial matters, without having to worry about the mechanical end. And, when you consider the great amount of space newspapers give to fiction, and when you compute what this space is worth to them, it makes you realize the importance of your job. "Anyone can go out and get big names and fiction, but it takes careful thought and a certain flair on the part of a syndicate editor to pick out the type that gives the kind of pleasure to a newspaper reader that will make him buy a particular newspaper as a matter of habit." V.V. McNitt, of the McNaught Syndicate, and former president of Central Press which was recently acquired by King Features, believes most of the consolidations have been the result of fortuitous circumstances rather than economic causes. "Speaking from my own experience," he stated, "Central Press could have been sold six years ago as well as this year. There was no fundamental economic reason for making the sale at this particular moment, and I believe that this is the case in some of the other changes. "Consolidations in the newspaper field have the tendency to limit the syndication market, and the expansion of the syndicates has more than supplied the demands of the press. These factors combined make it much harder to launch a new feature now. "Supplying newspapers with features is no longer the open game it used to be. It is now a business where you have to fight for everything you get. It is much more stabilized than it used to be, and hence in a much more healthy condition. "But I cannot believe that the recent mergers mean the death of the smaller syndicates. After all the fundamental principle of the syndicates is the discovery of talent, and there is nothing to stop a new idea from expanding. You can't monopolize brains. "To the writer or artist the most obvious advantage of the consolidations is that the features retailed by the smaller syndicates which have been absorbed are able to put up a stronger fron than previously. But it does not necessarily follow that the smaller syndicates have to go into mergers. To my way of thinking I believe it is desirable to keep an open market." "I do not view with alarm the recent syndicate consolidations and mergers. Editors whose newspapers have allied in a proprietary sense with one or more syndicates may temporarily restrict their buying of what are known as incidental features, but a good syndicate idea, whether it emanates from a larger or smaller syndicate, will always be salable to the newspapers of the country. "Newspapers allied directly with a syndicate will now have an opportunity to share the profits as well as the risks and the latter are sometimes heavy and expensive, as all syndicate men know. These facts should make editors of these particular newspapers more understanding so far as syndicate prices are generally concerned. "I think that the newspapers which are not included in the recent mergers will naturally be more interested than ever in the success of syndicates not affiliated with competing papers. This has been the case in the past so far as the relations of individual newspapers toward some newspaper-owned syndicates were concerned and this situation naturally will continue in the future. "I do not regard the recent mergers or consolidations as a trend of the itme but assume they resulted from related circumstances." What is the feeling of the syndicates and feature services not affected directly by these changes? The following statements may give some indication. "The Associated Press activities today in the feature service field are a natural outgrowth of what used to be the daily mail letter, which the Associated Press called the supplemental mail service. I held that since there was matter going out by mail it might as well go out in the best possible way that we could produce it, which, of course, meant the inclusion of illustrations, regular columns, etc. It includes news and semi-news features. "Operated on a cooperative basis without profit it is economically produced and delivered by a staff assigned for the purpose. Incidentally the Associated Press wire news service has been a great beneficiary of the activities of this staff, which includes specialists in various lines. They cover for the wire report news in their respective fields, and what can wait for mailing is included in the feature service." "First of all it must be remembered that NEA is a complete feature, comic and news picture service, and is not a syndicate. It charges a staple rate based on a newspaper's circulation, and the rates are subject to increase only as the newspaper grows. "My judgment is that the happy days when syndicate salesmen romped roughshod over the publishers of the country are over. There have been growing indications that publishers were getting tired of this and resistance on the part of publishers has been steadily increasing. To an outsider it would appear that the consolidations indicate that somebody desires to get in out of the wet. "NEA has not been affected in any way by the syndicate operations or the consolidations." Mr. Ferguson believes that smaller syndicates will have a harder time from now on, and that the recent activity is "decidedly a trend of the times." "If recent mergers in the syndicate business are to have any effect upon the general field that effect will be a good one," declared Harold Matson, editor of the McClure Newspaper Syndicate. "Anything that reduces the number of competitors is good for everybody concerned. As far as new features are affected, there is no reason to believe that three or four syndicates under one roof will be any smarter in developing new ideas than they were as individual organizations. No syndicate or combination of syndicates can monopolize the source of new material nor tie up the market on big names and big ideas. Editors will buy a good thing from any reputable organization. They do not like to be tied to table d'hote diets. This has been proved time and again. The outlook is fine." Harry Staton, manager of the New York Herald Tribune Syndicate, expressed the following opinion: "There is no questioning the present indication toward consolidation and I believe it means the elimination of some syndicates that have no more substantial reason for existence than a desire to make money. However, I believe there will always be a definite place in the syndicate field for independent syndicates that are operated by experienced men who sense feature value and possess the ability to sell. "The most important recent development in syndicate operation seems to be a move toward stabilization by a group of publishers and as it is not likely that all newspaper publishers will think alike about features. There will always remain a large percentage that will foster substantial syndicates calculated to develop new material and maintain a wide field for choice. And in this group will be found many of the publishers who are active in the control of the new syndicate organization." "While the several syndicate consolidations were in progress I was traveling in the interest of the World Syndicate and found that it was the uppermost topic of discussion among editors and publishers. The general opinion was that these consolidations were inevitable and that it would have a wholesome influence on the feature business. It is undoubtedly true that newspapers have been annoyed by the multiplicity of syndicates and the constant importuning of salesmen and they would welcome a weeding out process. They feel that too many mediocre features are being offered and while they have benefited by the lowering of syndicate prices because of intense competition, they are always willing to pay a fair price for really worthwhile features. "I am most optimistic regarding the future of the syndicate business and know that the great bulk of publishers realize the vital importance of the syndicates to their business of newspaper making in their respective communities. While the major portion of the business will revolve around the large syndicates, it is as true as ever that, as one editor expressed it to me, 'A real good idea will always be welcomed and will sell whether it is offered by one of the important syndicates or a man whose only physical equipment is an office desk, a telephone and a ready supply of telegraph blanks.'" Arthur W. Crawford of the Chicago Tribune Newspaper Syndicate stated, "The changes in the syndicate field won't hurt the newspaper syndicates -- rather, they will make them stronger than ever." John Elfreth Watkins, manager of the Ledger Syndicate, Philadelphia, believes that the trend is for independent syndicates to profit by association with newspaper groups which can lighten their overhead, especially when leased wires are involved. "It is notable," he says, "that nearly all of the syndicate consolidations lately announced crystallize about leased wires. "And conversely, leased wire services attempting to compete with the press associations -- now carrying what, until now, was classed as supplementary news -- need the added strength of the syndicates combining with them. "These consolidations, by narrowing the field of blanket services, will greatly benefit those syndicates which sell on their merits features which have been tried out independently and have passed the acid test. "Regardless of the previous individuality of the elements combined to form these consolidations, the resultant mass will reflect the selective genius of the controlling head. And the product of inspiration, whether it be drawn or written, will always excel the product of potboilers and imitators regardless of what syndicate distributes it -- provided that the distribution equipment can be maintained. "Generally speaking, syndicate consolidations are a symptom rather than a cause, of the weakening of the smaller syndicates. And pessimism affects the syndication market much as it controls the stock market. "When I entered the syndicate field I could count the established newspaper syndicates on the fingers of one hand.. Now more than a hundred are listed in Editor & Publisher Year Book. Such of these as distribute distinctive features carefully selected and edited by skilled and experienced newspapermen rather than salesmen enlisted from commercial life will be patronized by discriminating newspaper publishers whether they be a part of a famous consolidation or not. Those vending imitations and compilations will fly to cover beneath the protecting wings of the bigger syndicates, or be snuffed out." "Syndicate consolidations which strengthen quality and permit of expansion in service and scope of coverage should materially and economically contribute to the general benefit of newspapers whether they be daily or weekly. "If elimination of some of the smaller or weaker syndicates will enable the larger ones to render a more uniform type of service, coordinate and remove much duplication of inferior effort and establish a better code of trade practices, the newspapers should profit. A greater and improved variety of features thus might be made available and at a price and under conditions beneficial to newspapers. Many publishers have long felt there were more than enough syndicates even for the desired competitiveness and selective buying. Exclusiveness in features always will be of broad appeal. And to obtain the best in talent and hold a market for it will demand constantly larger resources and creative ingenuity. Maintenance of high class services in every respect requires existence of well-manages and equally able competitive organizations. "For these reasons and others there probably always will be a need and a place for a number of strong syndicates and the trend today possibly has that in permanent view. It does not seem to be a sporadic movement but one in recognition of a step somewhat delayed. Press association activity in the syndicate field has doubtless done much to stimulate the movement and, to that large group of papers where blanket services will satisfy, it will become a more powerful factor." "Consolidation between syndicates which practically duplicated each other's services is the logical result of this situation. Syndicates which serve no real purpose will be eliminated, while those which attempt to analyze the needs of the newspapers they serve and create quality features to supply those needs, will continue to progress. "This trend in the syndicate field is certain to react to the benefit of the newspaper publishers. During the past few years there has been a tendency among some syndicates to slight quality in their eagerness to place new and untried features on the market. Syndicates are now concentrating on fewer features and devoting more attention to the quality of their offerings. More thought is given to the mechanical needs of newspapers in the construction of features." When you think of Russ Westover, on the off change you ever do, I imagine the first and possibly only thing that comes to mind is Tillie the Toiler. Westover, however, has a lot of other credits to his name, albeit not icons like his Tillie. Actually Tillie came along rather late in Westover's career, which stretches back all the way to the 00s. 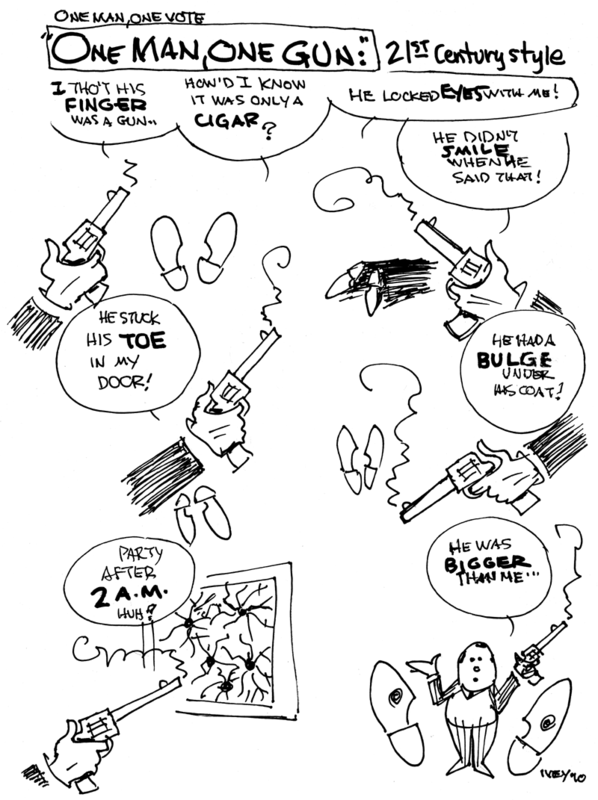 Today we're looking at one of his least remembered efforts, a short-lived daily strip called Romantic Raymond. This strip is the only series he produced for the New York Evening Telegram. The feature began on June 1 1919, a mere month after Harold Teen debuted. 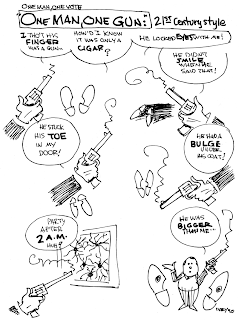 I mention that merely as an observation, no intimation at all that Raymond was a slavish rip-off of the other strip. Raymond is a lovesick teenager who schemes to impress his darling Betty and fend off her many other suitors, and that appears to pretty much sum up the entire plot of the strip. Oh, and Ray is inordinately fond of the term "Aw Crumps", a bit of hip slang which I suspect Westover made up himself. Romantic Raymond ran until January 31 1920, after which Westover seems to have been out of a job for awhile. Later that year he found a berth with the New York World where he stayed but briefly, and then to Hearst where Tillie was born. Thanks to Mark Johnson for the samples. Come to think of it, I do think about Russ Westover once in awhile, but usually in connection with Alex Raymond. United Feature Syndicate, Inc., this week announced the purchase of Metropolitan Newspaper Service, Inc. from Maximilian Elser, Jr., who will continue under the new alignment as vice-president. Both syndicates will retain their separate identities (for about two years - Ed.) and Monte Bourjaily, general manager of United Features, will direct both organizations. Metropolitan has been re-incorporated under the name of Metropolitan Newspaper Feature Service, Inc. The amount paid by United Features was not revealed. The feature staffs of both syndicates will continue undisturbed. George Carlin, chief of the editorial staff of Metropolitan, has been appointed to head the combined editorial departments and Albert Moody, United Feature production manager, is in charge of production for both organizations. Metropolitan has specialized in fiction, strips, humor and sports cartoons, while United has handled principally news features. It was to strengthen the fiction and cartoon branch of the service that the purchase was made. Mr. Bourjaily told Editor & Publisher. The combined syndicates serve about 800 newspapers in all parts of the world. United Feature Syndicate is about 15 years old. Its first general manager was Norris Huse, now manager of Associated Press Picture Service. Mr. Bourjaily joined it as manager in May 1928. It has concentrated on features based on the news written under the bylines of world figures. Among the statesmen whose writing it distributes are Rt. Hon. David Lloyd George, Benito Mussolini, Eduard Herriot, former Premier of France and Wilhelm Marx, formerly Chancellor of Germany. Occasional contributors have been Cardinal Cerretti, former under-secretary of state of the Vatican, who wrote the first authentic biography of Pope Pius XI; President Hoover, Winston Churchill, Portes Gil, Pascual Ortiz Rubio, Sinclair Lewis and Commander L. M. Kenworthy. The Ellis Service of Swarthmore, Pa., by arrangement with Dr. William T. Ellis, was recently merged with United, and its regular Sunday School lesson was started Jan. 1 this year. Other features handled by this syndicate are Heywood Broun's daily column, travel articles by Edward Hart II; "Beauty and How," by V.E. 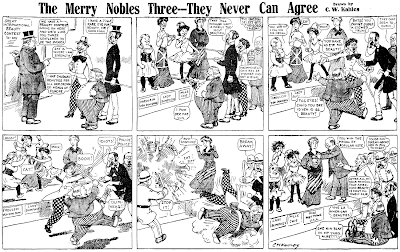 Meadows; and two comic strips, "Doings of the Duffs," continued by arrangement with Mrs. Theresa H. Allman, widow of the creator, and "Young Buffalo Bill," by Harry F. O'Neill. United is also authorized distributor for the fashion services of Fairchild publications. 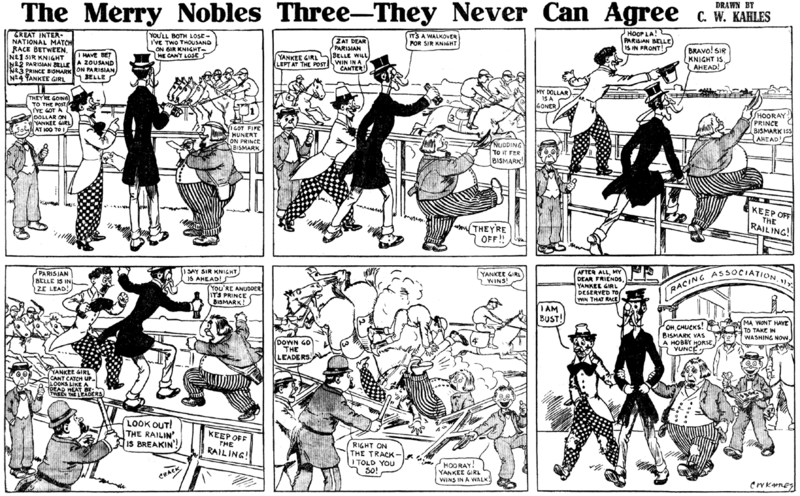 The sport cartoon by "Stookie" allen has been changed to a sports strip, "No Foolin," which will feature the comic aspects of sport. The purchase of Metropolitan gives United the benefit of Feg Murray's daily sports drawing. One of the leading features acquired from Mr. Elser's syndicate is the Twelve Star Serial Wheel, which provides a 30-installment story for each month in the year. Writers represented on the service's list are Mary Roberts Rinehart, Edgar Wallace, P.G. Wodehouse, E. Phillips Oppenheim, Clarence Budington Kelland, John Esteven, Gene Markey, J.S. Fletcher, Rafael Sabatini, Frank R. Adams, Henry Kitchell Webster and Sax Rohmer. Humorists whose writings Metropolitan has handled are Stephen Leacock, Sam Hellman, Ellis Parker Butler, Donald Ogden Stewart and Richard Connell. The syndicates art included, in addition to the Feg Murray cartoon, "Dickey's Dogs" by Robert L. Dickey; "Ella Cinders" by William M. Conselman and Charles P. Plumb; "Good Time Guy" by Fred Fox; a "Tarzan" strip based on Edgar Rice Burrough's stories; and "Folk Tales" by Edward McCandlish. Metropolitan was organized by Mr. Elser in 1911 and has remained under his direction since then. Earl Hadley, vice-president and part owner for several years, recently sold his interest to Mr. Elser and retired from the syndicate field. Mr. Bourjaily, who will direct both syndicates, worked on several newspapers in the east and mid-west before joining United Press. He was graduated from Syracuse University in 1917, worked on the Syracuse Herald until the war, when he enlisted in the army air service. After the war he went to the Cleveland Plain Dealer and later was in the office of the editor-in-chief of the Scripps-Howard Ohio dailies. He served as publisher of the New Haven Union and later of the Yonkers Statesman. He joined United Press in 1926. 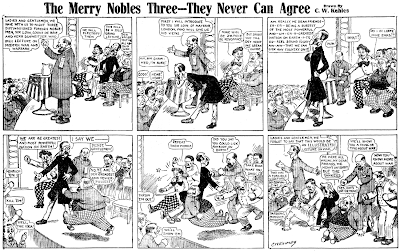 Then, in 1931, they got the World Syndicate strips (Fritzi Ritz, Captain and the Kids, more). Following the 1929 crash there must have been some good bargains. So anyway, was this the start of United Feature growing bigger than NEA, or had United already surpassed NEA in syndicated offerings? Nah, United was still a rather small fish, at least stripwise. It always seemed odd to me that United bought Metro and not the other way around. Metro had a big hit with "Ella Cinders", whereas United really had nothing to compare. Course that's just my blinders -- evidently United was doing well with their news features. NEA is a whole different sort of animal than 'normal' syndicates, being a blanket service for smaller papers. I think comparing it to United is a tough one since their business models were completely different. I pride myself on the completeness of my reference shelf, but this book has long been lacking because of the price. On the used market the asking price has often been over $50 which I wasn't willing to spend considering I didn't know much about what I'd be paying for. Recently, though, I snagged a copy for $25 on abebooks.com, and I feel that I got my money's worth. 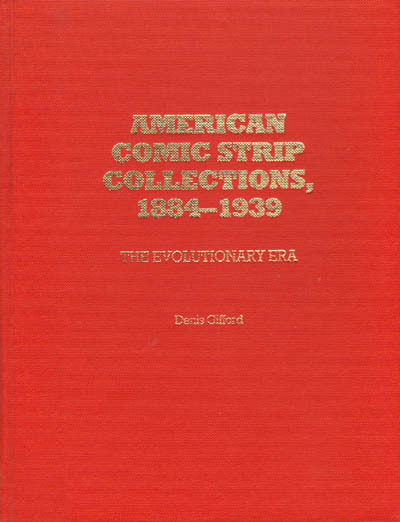 In the book Gifford describes every comic strip reprint book and comic book in the era ending in 1939. Well, not really every one since there are a few missing here and there, primarily ultra-obscure items. He wisely limits himself to collections based on comic strips as opposed to panels, which would have made for a much fatter book, but forgets his rules occasionally by listing items such as a Strange As It Seems collection. Each entry gives the title, publisher, publication date, page count, size, original price if known and a description of the contents. These descriptions vary in quality, I think because he had to rely on second-hand information for some books he was unable to peruse for himself. However, in general the descriptions are excellent and of definite value to researchers and collectors. Many of these books are hard to get hold of, and cost a pretty penny if and when they are available, so it's great to have such thorough descriptions of the contents without having to shell out a wad of cash, especially if you're just curious about the contents like I am. The publications are listed chronologically, and I found it all very interesting reading until we hit the comic book era and my eyes started to glaze over a bit. Of course, many readers will find this the most valuable part of the book. Since the chronological listing can make finding a publication a bit tough, I was delighted to find both character and creator indexes at the back of the book. I for one welcome the chronological listing, it helps put things in relative perspective. It's on my "wwish" list now!